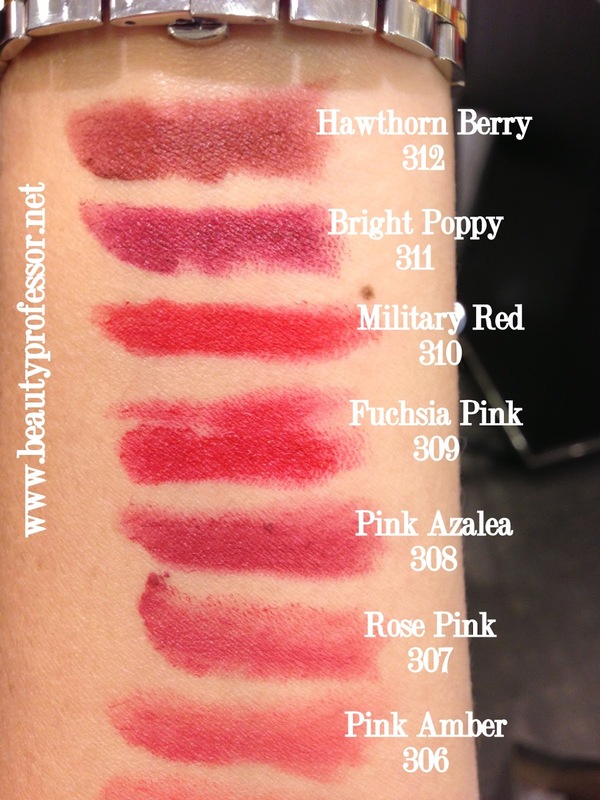 Beauty Professor: Burberry Lip Velvet Swatches of All 12 Shades...Finally, a Comfortable Matte! Burberry Lip Velvet Swatches of All 12 Shades...Finally, a Comfortable Matte! When I read that Burberry was releasing a new line of matte lip color, I couldn't order a tube fast enough...I picked up Pink Apricot (the lightest shade, naturally) and am beyond pleased with the formula, moisture and lasting power of this formula. 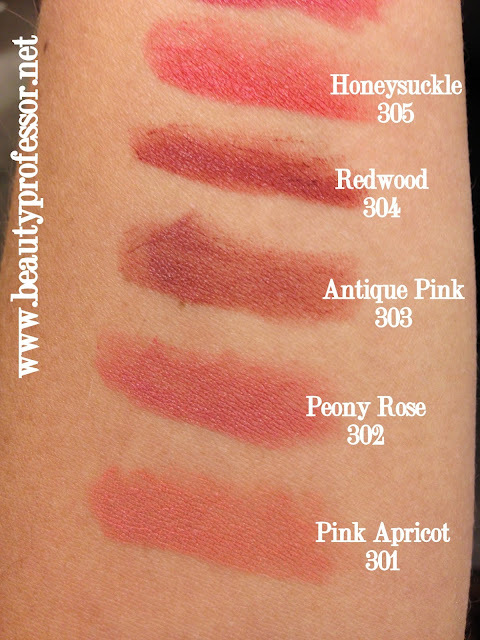 While I am currently working on a proper review of Pink Apricot (#301), I wanted to share the swatches I hastily procured last week at Nordstrom...it was evening, so I couldn't take any shots in natural light. Burberry innovation brings a new finish for lips: a velvety matte radiance, inspired by the most opulent of English fabrics. Iconic pigments provide incredibly dense and luminous color, gel technology gives comfortable long-wear performance, while triglycerides and wild rose continuously hydrate. The result is effortlessly elegant, protective and breathable. I hope these images are of use for those of you ordering online...I am loving the Burberry Lip Velvet; it is a truly hydrating matte option, perfect for fall and winter! 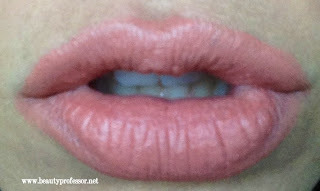 Above: Burberry Lip Velvet in Pink Apricot #301 alone on the lips. Bottom Line: Burberry has crafted a winning lipstick with the Lip Velvet formula...it is highly pigmented, rich, hydrating and lasts forever...so happy with this purchase. Keep your eyes peeled for an up close and personal look at Pink Apricot soon! I completely agree with you--Pink Apricot does not disappoint!! 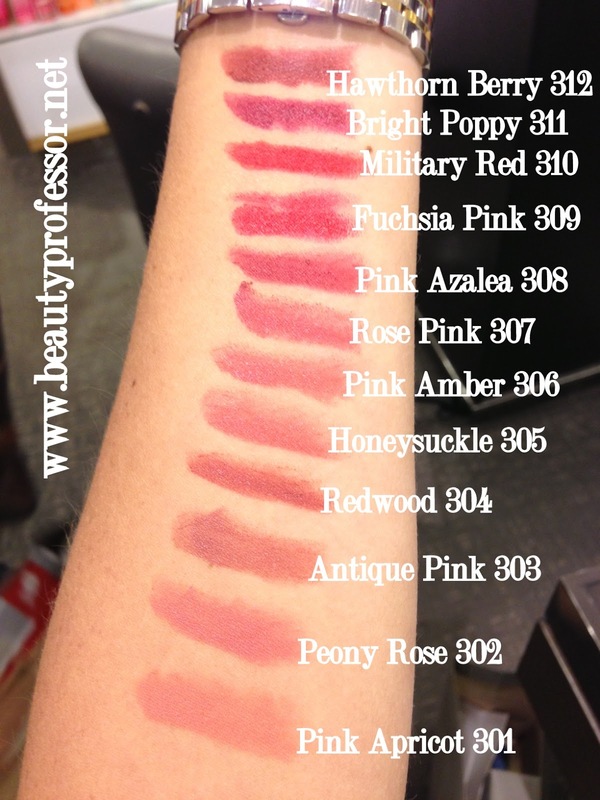 **Thanks for the swatches, BP. I am not surprised that you would like Pink Apricot too ; ) It is a lovely color...glad you enjoyed the swatches...my pleasure! Wow so many gorgeous shades. Military Red looks like the perfect red. This product sounds amazing, I've never seen a lip product with this finish that's still hydrating. Yes, Catherine...the colors are gorgeous! Military Red is getting a lot of buzz! I am still so impressed by how moisturizing it is for a matte...loving it. I can't wait to get to the counter and try these! Thanks for the swatches. I'm all over Hawthorne Berry and Military Red. You have me leaning toward Pink Apricot, too. Thanks for the comment! 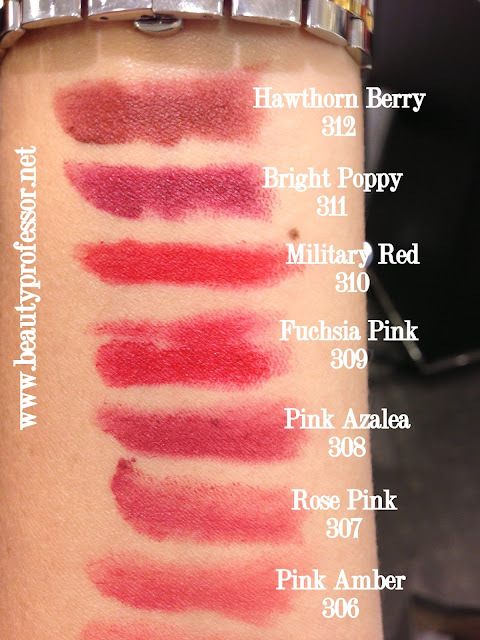 My pleasure to provide the swatches ; ) Hawthorne Berry and Military Red are so vivid and rich...just beautiful for dark lip color lovers. I am still adoring my PInk Apricot...let me know what you get! OMG!!! I super love the colors. I will having a hard time choosing what to try out but I guess I have to decide which to try out first. I guess I will be picking the Pink Apricot too. Light and natural which is perfect for everyday wear. Thanks for reading and do take care! These all look great especially Military Red! Looking forward to your full review on Pink Apricot too! Thanks, Krystal...and the formula is to die for! A full review of Pink Apricot coming up soon!